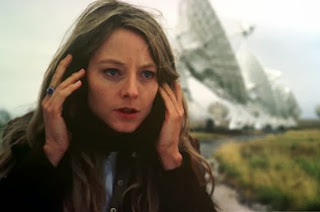 I recently re-watched “Contact” (1997) and was surprised how relevant it was to current issues, including religious terrorism and the conflict between faith and empiricism. But what really jumped out at me was the discussion over public funding of the sciences. Science must first and foremost be accountable to the people paying for it. We need to stop wasting money on pie-in-the-sky abstractions and start spending it on practical, measurable ways to improve the lives of the people who are, after all, footing the bill. Her funding gone, Arroway then starts frenetically writing grant proposals and finally finds private sector support from eccentric billionaire S.R. Hadden (John Hurt). He has taken a clear intellectual interest in Arroway’s work and pops into the story from time to time to influence her career. He also uses his vast technological resources to hack into the secured research project and make suggestions. Hadden’s influence on the project is depicted as mainly beneficial (actually providing a key discovery at one point), but it reveals the compromises one makes when obtaining private sector funding for scholarly research. It also makes the research suspect — at least one important character is convinced by the end of the film that the entire alien message discovery was a hoax perpetrated by Hadden. Meanwhile, Drumland, as head of the NSF, has continued to haunt Arroway, threatening to deprive her now-funded research from use of a federal facility in New Mexico. And then when Arroway’s research actually produces results, Drumland takes it over for the federal government, depriving her of the publicity and control she had rightly earned from her hard work in an unpopular area of science. The message is very clear — had there been a less politicized NSF that was more open to pure research, Arroway’s research would have produced clearer and more credible results, the bizarre Hadden never would have been involved, and the scientists responsible for the research would have received the proper credit. You feel so lost, so cut off, so alone, only you’re not. See, in all our searching, the only thing we’ve found that makes the emptiness bearable, is each other. Today, this seems like a clear message urging unity among radio astronomers, political scientists, and other scholars facing cuts from the National Science Foundation.